Two thousand years ago, long before France was France, the Roman invasion was spreading throughout the known world. In the first century BC, a small settlement on a corner of land bordered on three sides by the River Lot, was conquered and the town of Cahors was established. The Romans built an amphitheatre and public baths, and a section of Roman wall, uncovered during archaeological excavations, has been preserved in the car park below the Chamber of Agriculture building. When you arrive in Cahors, call into the Tourist Office on Place François Mitterrand and ask for Itinéraires à travers la ville—a map which will guide you around town passing 44 historical sights. From the twelfth until the fourteenth century, Cahors prospered. Trade along the river flourished and bankers and merchants relocated here from as far away as Lombardy in Italy. Wine from the region was exported throughout France and beyond to Great Britain. In the fourteenth century, during the Hundred Years War, a defensive wall with eleven towers and two gates was built along the northern edge of town. (The River Lot provided protection on the other three sides of town.) All that remain today are Tour Saint-Mary, Tour de Morlaas and Porte Saint-Michel in Rue de la Poudrière. Boulevard Gambetta, the main street, divides Cahors neatly into new and old sections. Hôtel de Ville (Town Hall), Palais de Justice and other important civic buildings were built on the western side in the nineteenth century but to the east, you’ll find the cathedral and many houses dating from the thirteenth to sixteenth centuries. If your time is limited, or you’ve done enough walking over the last few days and weeks, Le Petit Train de Cahors will whisk you past all of the main sights in under an hour. It leaves from Quai Valentré and operates every day from May until September. The Tourist Office also offers several walking tours based around a variety of themes, such as history, wine or monuments such as the cathedral and Pont Valentré. Construction of Cathédrale de Saint-Etienne began in the eleventh century, although the site had been a place of worship for five hundred years before this. The nave that you stand in today dates from 1120, the north portal was added in 1150, and over the following six hundred years, the building was enlarged to include a choir and several chapels—resulting in an eclectic mix of architectural styles. The cathedral is closely surrounded on both sides, but a wooden model built by monks allows us to appreciate the detail and beauty more closely. Early in the sixteenth century, a cloister was added next door and remains an oasis of calm and tranquillity despite the constant parade of visitors. 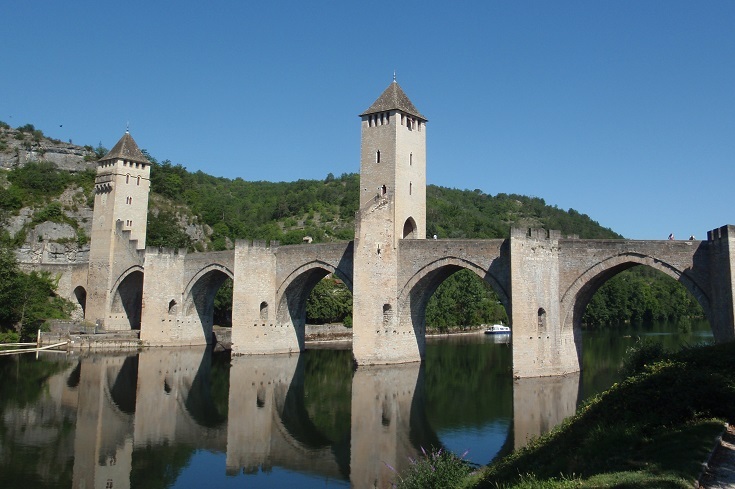 By the end of the fourteenth century, three bridges spanned the River Lot connecting Cahors to southern France. The oldest two have long gone, but work on the newest and most famous bridge, Pont Valentré, began in 1308. Legend has it that the architect of Pont Valentré became increasingly worried as construction took longer than expected and funds ran out. He asked the devil for help and promised to pay him with his soul when the bridge was complete. When construction was almost finished, the architect devised a way to free himself from his pact by asking the devil to bring water for the remaining work using a sieve. Of course, the devil was unable to comply and so, was never paid. In a final twist to the story, it is said that one stone remains missing from the bridge and whenever it is laid in place, another falls loose. During restoration of the bridge in 1879, a small sculpture of the devil was added high on one of the towers. The highlight of my stay in Cahors was a visit to the Musée de la Résistance on Place Bessières (across the road from Place Charles-de-Gaulle). The museum is free (donations welcome), open every afternoon and staffed by passionate volunteers. The day I visited, we were shown around by a delightful lady – a young girl during the war – who explained the exhibits in a mixture of French and English. The museum is overflowing with photos and artefacts from WWII – depicting everyday life in Cahors during the German occupation, the hardships, the dangers and the role of the resistance and pays a moving tribute to the bravery and often distressing fate of those who risked their lives to protect their countrymen. 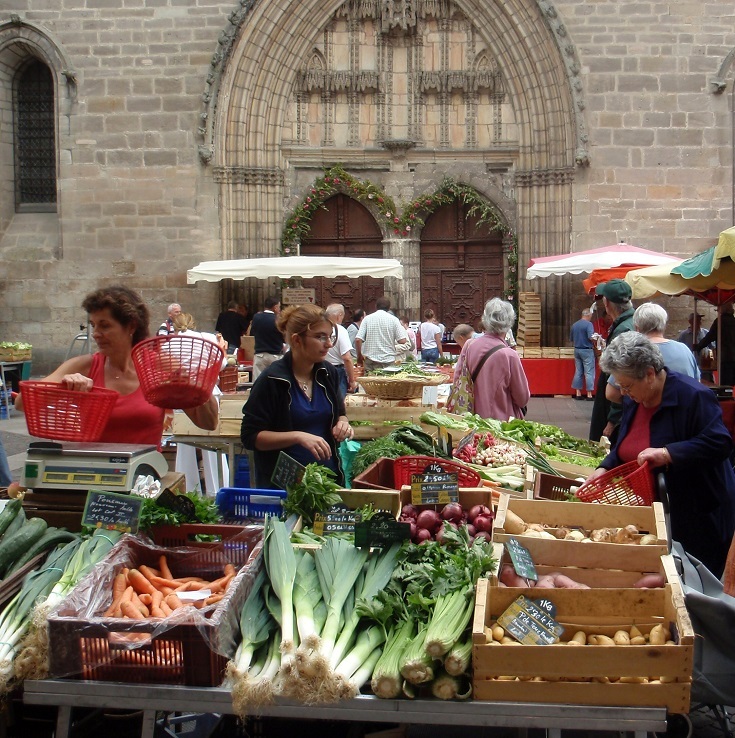 If you are in Cahors on a Wednesday or Saturday morning, combine your visit to the cathedral with a wander through the market which sets up in front of the church. Like markets everywhere in France, these are a feast of fresh, local produce including fruit, nuts, olives—in fact everything needed for a delicious trail mix blend and much more! The area around Cahors is well known for its wineries. If you are able to base yourself here for a few days, rent a car and head out into the countryside to discover them. The Tourist Office has a number of brochures describing suggested day trips. Which long-distance walk visits Cahors? Melinda, though I feel fortunate to have tiptoed through France on many occasions, your posts remind me that there is much more of the country yet to be explored. The Pont Valentré is incredible! Thanks Tricia. I love the carving of the devil high on one of the towers and the story behind him being there! I am currently exploring Brittany – an area new to me. The coastline along the western side is staggeringly beautiful! Thanks Tricia. Mont-Saint-Michel is not on the itinerary this trip but I hope to get there later this year!